As Townhall previously reported, a CBS poll released today showed that more Americans than not want illegal alien families either detained or deported all together. But, that same poll shows that 51% of Americans believe that a wall along the United States southern border is a good thing, even if that structure does not span coast-to-coast. According to the poll, 32% of Americans believe that "a wall along the U.S. Mexican border" is a "good idea that can probably be completed." 19% of those polled answered that the wall is a "a good idea that should be tried, even if it cannot be completed." 48% of the 2063 adults polled said the wall was a "bad idea." The CBS poll was conducted last week from June 21-June 22. 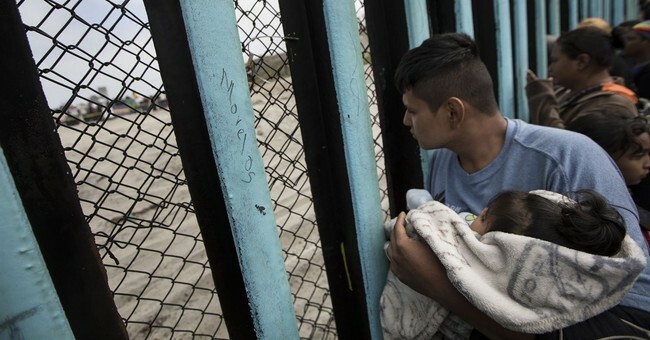 The poll comes after nearly two weeks of intense national scrutiny of the Trump administration regarding its handling of the southern border child migrant crisis. Democratic officials, liberals, and moderate Republicans have blasted President Trump for his "zero tolerance" policy of separately detaining illegal alien children from their parents when caught crossing the Mexican-American border. President Trump has long promised a "big beautiful wall," but so far has been unable to receive the necessary funding. In an op-ed on Friday, liberal commentator Andrew Sullivan argued that Democratic representatives should give Trump "his f*cking wall. He won the election. He is owed this. It may never be completed; it may not work, as hoped. But it is now the only way to reassure a critical mass of Americans that mass immigration is under control, and the only way to make any progress under this president." But, Independent Sen. Angus King of Maine, who often votes against Trump, argued today that just a few months ago Congress actually had given President Trump the necessary funding for the border wall, but the White House opted to decline the bill in hopes of getting more political victories. Sen. King told NBC "Meet the Press" host Chuck Todd that, "Mike Rounds and I had an amendment, it was the one that got the most votes on the floor of the Senate. We got 54 votes. It was in a sense DACA for the wall. And the wall was fully funded. The Democratic Caucus voted, I think, 46 out of 48 members, 49 members for it. That was a hard sell. But the White House itself torpedoed the bill. They threatened to veto, they sent out a scurrilous press release from DHS and we had the votes. We had probably 65, 67 votes. They killed it. They had the wall in their hand and they let it go because they wanted more." Despite President Trump signing an executive order last week that stopped the separation of families apprehended at the border, it is unclear where the debate on this issue will lead before the 2018 midterm elections.